The incredible number of eyeballs on Stories means that brands and businesses that don’t utilize the format are missing out. Advertising on Instagram and Stories are on the rise, but businesses should also focus on creating eye-catching, engaging, and ultimately persuasive organic content as well, in order to appear naturally in users’ Stories feed. The only issue with this plan is that a user may follow hundreds or thousands of other accounts. How can you rise above your competitors and consistently appear near the top of your followers’ Stories? There was a time when Instagram delivered photos and videos to your feed based on when users added them chronologically. A few years ago that changed, and now an algorithm that is reportedly based on engagement decides when and where posts appear to you. When Stories debuted in August 2016, the algorithm was already in full effect. While that algorithm has been tweaked over time, its mission remains the same: Instagram wants users to spend as much time as possible on Instagram – viewing ads, engaging with brands – and so they will show users what they think those users want to see. Therefore, if someone demonstrates a history of interacting with an account (liking their posts, commenting, direct messaging, and yes – watching their Stories) then Instagram will elevate their posts to the top of your feeds. Create more likable photos by following a few ground rules: According to research by Curalate, images with a single dominant hue, images with blue as the main color, images with more background space (to give photos depth) and images with low saturation are all more likely to get likes – and thus to make an impact on Stories. Engage with polls and quizzes: Everyone in digital marketing knows the power of the call-to-action. Stories make it easy to get people to click, with polls and question stickers that you can share the results of to drive even deeper engagement. Go bold with your text: Make creative choices with the text that you overlay on photos and videos. Use easy-to-read fonts, different colors, and prominent messaging and copy to keep people clicking through. Share user-generated content: Harness the power of your followers to share quality content that your business spent zero time making. Fellow users will be inspired to submit their own work, and check back often to see if they made the cut. 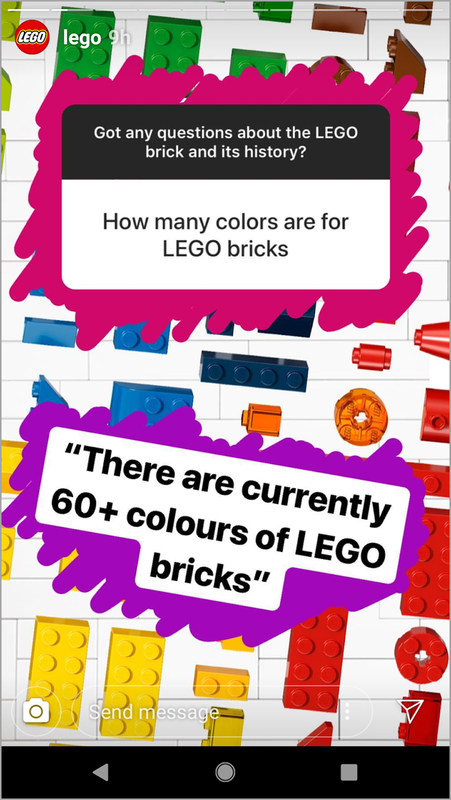 Via @LEGO: A combination of kaleidoscopic colors and question stickers creates a fun, informational Story post. Whether you’re writing a blog post or posting to social media, hooking consumers instantly is the goal. Your introduction – or in this case, first post or two of your Story – should make it clear what you’ll be offering viewers. Don’t be coy, because all it takes is a swipe for people to move on from you entirely. Whether you’re making a how-to video or tutorial, premiering special behind-the-scenes footage, or presenting followers with discounts and deals, take the time to make the introduction of your Story as strong as possible. Even if people move on before the Story finishes, nothing drives down your engagement like an immediate pass. If you have a Business account on Instagram, you can view your Story “Insights” to see how people are engaging with your posts – including where you might be losing users over the course of a Story. How-tos and tutorials: Does your business have a product that could use a walkthrough? Is finding your brick-and-mortar location from the subway something of an adventure? Use your Stories to create fun tutorials that provide value to your followers. Plus, you can also save them to your profile for repeat viewing, or for future followers to find as well. Behind-the-scenes footage: Especially useful for B2B companies who want to show off their company culture, behind-the-scenes Stories of your office space, an event or conference your team is attending, your warehouse or factory, or any other work setting that can’t be captured in a single photo or video works great on Stories. Deals and discounts: If followers realize that you’re posting exclusive offers on your products or services to your Stories, they’re going to check in far more often. Nothing motivates people like a good discount. 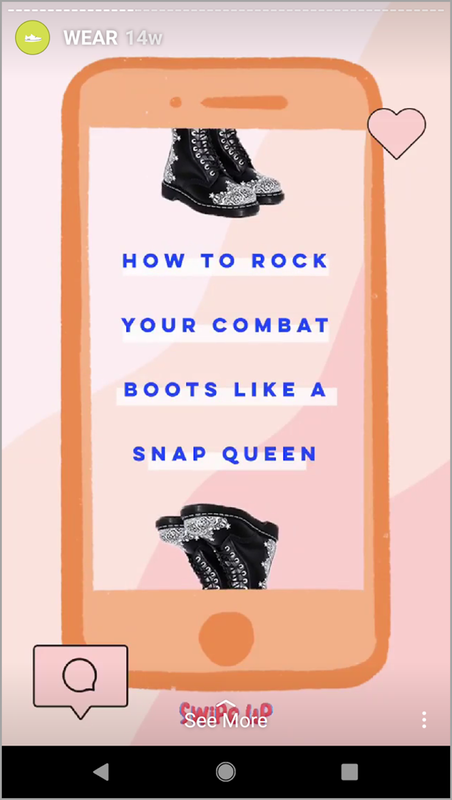 Via @britandco: Teach and inspire followers with tutorials that they didn’t know they needed. Extra points if you link these photos and videos to even more in-depth content on your webpage for additional engagement. You’ll need at least 10,000 followers to gain the “Swipe Up” option that takes users to a different page, but you can also use the “Mention” sticker to reroute users to your bio, where your bio link is waiting to direct them to your off-channel content. Instagram is pushing hard for users to watch more live video and long-form video thanks to the rollout of their IGTV feature, which offers TV episode-length videos. They also prominently feature live streams at the top of each Stories list as a way to alert users of ongoing streams. Too much live streaming for a small business account can come across as spammy, but a well-timed use of the feature can both provide followers with fun insight into your office culture, a day in the life of an employee, or a fun event that you’re throwing at your brick-and-mortar location – as well as catapult your account to the top of your followers’ Stories feed. This is good practice for any social media account you operate: Remember, your activity is not a one-way street. Creating high-quality, timely, useful content is important, but so is engaging with other accounts on the platform. Reply to comments left by followers, invite users to DM you customer service issues (and respond when they do), and comment on the posts or Stories of users who tag you or use your company tags. The point of your business accounts on social media is not to simply be another mouthpiece for the company, but a channel where followers and customers get to see the “real” you. By engaging with other users, you break down the walls between customer and brand – plus, the more users interact with you, the more likely you’ll reach the top of their feeds. Location geotags on Stories are a great way to gain local exposure, and to appear in the feeds of people who don’t follow you but are exploring that same spot. You can go broad with your geotags – tagging entire cities, such as New York – or go hyper-local by tagging your neighborhood. You might gain new followers who enjoy your contributions to the location’s social media footprint. Hashtags work much the same way, though they’re most effective when you create your own specific hashtag that leads to a run of on-brand content. You’re less likely to get found in the sea of #fashion or #retail posts – but the occasional well-placed tag can catch fire on the Discovery feed as well. Using both of these options on key posts is a great way to find new followers and boost your overall engagement. When all else fails, or when seeking an extra boost, you can always try hacking the system with the “hide/unhide” hack. The Tab figured out this trick: Post a story, then “hide” it from the person you want to see your story. Quickly unhide it, and your story will reportedly jump to the top of their Stories queue. If you’re looking to grab the attention of thousands of followers, this hack is time-consuming and may not pay off in the long run. But when you’re first starting out, it may provide the jumpstart you need. Just don’t forget to also follow the above tips, so your content becomes the driving force behind your engagement, not tricks. Ranking higher on users’ Instagram Stories is a great way to stay top-of-mind for your followers. You’re far more likely to generate leads and see repeat business if you’re there every time someone opens their app. As marketing tactics go, this concept can be highly effective – plus, it’ll probably be a lot more fun than you realize. There’s a reason why Instagram has over a billion users: It’s because Instagram is a good experience. With good content that keeps people wanting more, you can help keep it that way.